The temperatures are dropping in most climate zones and our outdoor growing season is coming to an end (sort of). But did you know that November is a great time to plant new trees in your landscape? There are many factors from a plant health perspective that make November a good planting time. Perhaps you have already discovered another advantage to a late fall planting. Reduced cost! Many garden centers and nurseries will offer tree stock at cheaper prices in order to sell down their overstock for the season. I have purchased many quality trees at this time of the year at great deals and have been pleased at how well they have done since their planting. You do need to choose your plant stock wisely however, as it is often the case that you are choosing from the “left-overs” from the season gone by. If you know what you are looking for it will not be too difficult to decide which trees are going to grace your yard with years of beauty and shade and which trees are going to need replacement in just a few short years. Look out for circling roots in the root ball. This will occur more often in container grown stock but it can happen in some balled and burlaped trees. Circling roots will more often than not develop into large girdling roots. This will put a great deal of stress on your tree. In time, your tree will become weak, stressed, and prone to disease. Ultimately your tree will die prematurely from this problem. Most often you can see this defect on the top of the root ball. You may have to pull the tree out of the containers to see this problem on some trees. 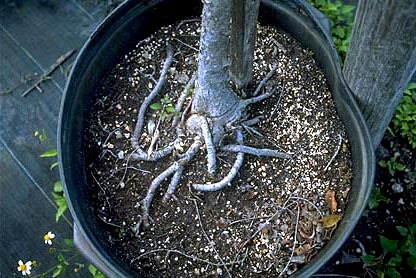 Trees with roots that circle around the bottom and sides of a container are called “pot bound” or “root bound” and have likely been in a container a size too small for a while. Trees with this problem will not prosper and often die from stress related diseases at an early age. Circling roots can start off seemingly small, and inconsequential. If ignored however, those girdling roots become a leading cause of mortality for new plantings. Look at this tangled mess of self choking roots. Kinked roots, much like circling roots, are often caused from trees growing in too small of containers for too long .These deflecting roots will keep your tree from growing in to the full stature that a tree on your property should have. Tree roots that are kinked or deflected at extreme and awkward angles can cause problems for a tree. Water and sugars have a difficult time passing this severe turn in the root. Kinked roots can also cause a tree to be unstable and loose in the soil. This kinked root will ultimately cause problems for this tree as it grows. When young, smaller kinked roots can be pruned out with some degree of success but it is better to avoid these problems all together if you have other plant stock available to you. Another thing that you will want to look for in the root system of your tree is the root flare. That’s the area of trunk that transitions into roots just at ground level. The root flare should be just above ground. The root flare of a tree should be located just above the soil level.If possible, look for trees in the nursery that are already, in the ball or container, at the proper depth. Often times, trees come from the nursery, already buried in the ball. If this tree has been in this state for too long, damage will have been inflicted on the bark tissue and stress related diseases and trunk rot can easily occur. On more common root problem that nursery stock can often develop is a loose root ball. If the tree trunk moves back and forth in the root ball easily then this tree will have trouble standing up without some sort of guy system and it will have trouble putting out any new root growth. Carefully look at the stem and main branches of the tree. Do you see any damage from insects or diseases? Is there any mechanical damage and wounds on the stem from rough handling ? Torn bark and frost cracks on the stem will serve as entry points for decay to enter the tree in the future. Check for swollen areas and any signs of cankers, scale, and borer damage on the trunk. Look care fully at the stem and limbs of trees before purchasing. This tree has been chewed on quite a bit by a rabbit. This will lead to a decline in the trees long term health. Look out for any damage to the stem such as this canker which has killed the cambium layer of this tree. Damage like this could be caused by a disease or just by rough handling. Codominant stems are two or more trunks on a tree that are both taking on the role as the main leader for upward growth in the tree, as opposed to one single trunk with many lateral branches. The ideal structure for a tree is one central stem with evenly spaced lateral growth growing from that stem. Trees with co-dominant stems are lesser in quality because of their inherent weakness. Trees with two or more stems, clustered together are prone to splitting apart as they grow bigger and experience high wind or snow fall. This trait is considered a defect because often the angle between these two stems is such that the attachment is a weak point in the tree. Trees with co-dominant stems are more likely to fail in storm events. Sometimes vendors sell trees with improper pruning cuts such as stubs or flush cuts. Stubs are branches that are pruned in the middle of the branch, rather than outside of the branch collar of a lateral branch or trunk where proper cuts should be made. Proper cuts are made just outside of a branch collar because this part of a tree is equipped to actively seal over the wound and prevent decay. This function is not as active in the middle of a branch, and stubs are more susceptible to decay and sprouting. Flush cuts occur when a pruning cut is made right at the trunk, which removes the branch collar. This is also an improper cut which makes the tree more susceptible to decay. Look for minimal stubs or flush cuts on the tree you purchase. If a few stubs are present, they can be pruned back to a branch collar. Stub cut such as this are not only unattractive but unhealthy for the tree. Watch out for trees that have too many stubbed branches and improper cuts as they will have abnormal growth patterns. On the other hand, a tree with many flush cuts is not desirable either. These types of cuts make it difficult for the tree to close over the wound with new callous growth and create an opening for decay to set into the stem. Learn how to identify and make proper pruning cuts. So again, November is a great time to plant a new tree in your landscape. It is possible to find quality trees at this time and with a little bit of attention to the condition of the tree your tree you can select a tree that will last for many years to come and will add beauty and value to your property. Forest Keepers is a local, family-run business out of Lawrence, KS serving the entire Kansas City metro area (75 mile radius). We provide a full range of tree care services: Tree Trimming & Pruning, Tree Removal, Stump Grinding, Clearing & Brush Hauling. We have several expert tree climbers with decades of combined experience who can safely take care of any dangerous overhanging limbs or leaning tree, even close to your house or power lines. Our ground crew is meticulous and cleans up after the job with great care & attention to detail. Let us bring proper care to your trees!